This unit goes far beyond what a basic unit on adjectives and adverbs might cover. This unit covers four tests for identifying adjectives, sentence positions for adjectives, nouns as adjectives, participle adjectives, paired adjectives, hyphenated compound adjectives, proper adjectives, advanced sentence composition with adjectives, three tests for identifying adverbs, adverbs made from adjectives, misplaced adverbs, avoiding adverbial intensifiers, comparative and superlative forms. 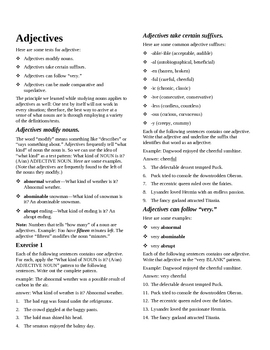 This Adjectives and Adverbs Unit contains . 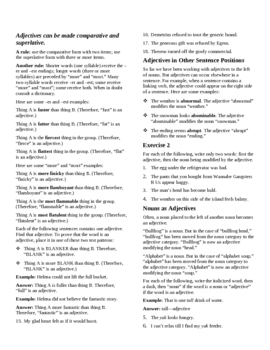 . .
--An eight page handout: five pages of adjective material and three pages of adverb material. --A five-page answer key to the exercises. --An Adjectives and Adverbs Test, in two versions for alternate row distribution, with an answer key.